Skiathos Castle was strategically situated at the northern part of the island on a high rocky cliff extending all the way to the sea. 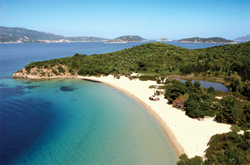 The panoramic view of the surrounding area as well as the fact that only a thin piece of land could link the cliff with the island of Skiathos, were the main factors to determine its ideal location as an unconquerable shelter from the pirates. In the past, a wooden moving bridge united the castle with the land currently replaced by cement stairs leading at its entrance. Although the 300 habitats and the 22 churches were abandoned and partly destroyed through the years, visitors can still admire its impregnable town walls, a few finely restored houses, the trademark drawbridge, the Turkish baths and remnants of only three churches including the one of Christ, making this visit a memorable experience. The fort was also used during the battles of Greeks against the Turks, until the island's liberation when the seaside port offered a better life for the locals. The stunning view of the Aegean Sea with the picturesque beach full of sailing boats, the northern part of Skopelos as well as the mainland, justify those who are willing to take the trouble of climbing in this magical area of the island. Skiathos is also the homeland of Alexandros Papadiamantis, one of the most prominent Greek writers, with a strong spiritual and theological vision well reflected on his novels one of the most renowned being ''The Murderess''. The house where the writer lived nowadays host a museum to honour the life and work of Papadiamantis. Roofed under an 19th century traditional building actually constructed by the writer's father, and finely preserved to date, exhibits personal belongings, family objects and furniture, while the former storage room of the building currently exhibits manuscripts, photos, unpublished editions etc. The monasteries of Skiathos, other than being of remarkable beauty and religious value, are also an integral part of the Greek history. The Monastery of Evangelistria built during the 17th century was the one to actually bless the first Greek flag, putting a white cross in a blue background and the place where leaders of the Greek revolution against the Turks took an oath. The monasteries church itself is very impressive with a wooden chancel screen with fine drawings, while a small museum aside the monastery exhibits rare ecclesiastic heirlooms, byzantine icons, books and manuscripts. The Kounistra Monastery (swinging) was built during the 17th century where a monk found Virgin Mary's icon hanging on a tree. Only a copy of this icon is at the monastery as the original can be found at the Town of Skiathos. The Monastery of Saint John also called Krifto (secret) used to operate as secret school during the Turkish occupation, while the Monstery of Pangia Kehria is built on a bulk above the homonym cove and is the most isolated one to house unique ecclesiastic heirlooms while offering glorious views. For those with religious or spiritual interest, visiting Skiatho's monasteries can prove to be an unforgettable experience. 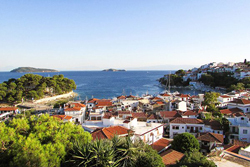 Situated in the Sporades complex of islands, Skiathos despite its small size as an island offers many different types of activities for those who wish to spend quiet days on the beach, as well as those who want to get out and explore. Several organized beaches offer a large variety of water sports such as water-ski, jet ski, water loops, windsurfing and parachuting, while the diving centre gives the opportunity to certified divers to explore the local underwater world. A number of tennis courts and a tennis club welcome the lovers of this sport, while a horse riding centre near Koukounaries with a fully trained staff, provide the chance of unique rides along un-chartered trails and mountain peaks. 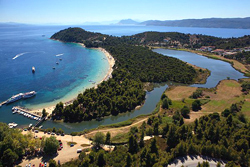 Jeep safaris are also offered for touring around the medieval part of the island, while a plethora of sailing or motor-boating is available for exploration of the island along with neighbouring destinations such as Skopelos, Alonissos, Athens and Meterora. On the other hand, privately hired small boats give the opportunity to discover the secluded bays of the island on one's own pace. Although the size of the island is relatively small, it counts the astonishing number of 60 beaches around its lacy coastline. Koukounaries is among not only the island's but also Greece's most famous beaches, very long and white sandy with a beautiful protected biotope to surround it. Lalaria beach is one of Skiatho's landmarks with white sand and a huge arch-like, or as locals call it a penetrated rock to enter the deep blue waters. The beach of Lalaria is also renowned for its amazing complex of caves, Blue, Dark and Bronze named after their colorful impact on the sea, situated right before the beach, are all well worth a visit, only accessed by boat. Agia Paraskevi is a fully organized beach resort, also ideal for families, while the little Banana nudist beach is right over a big rock after leaving the a fully organized popular Banana beach. Other wonderful beaches of the island of equal beauty to ensure times of relaxation and leisure are between numerous others, Kanapitsa, Vromolimnos, Agia Eleni, Ahladies, Aselinos, Kolios etc.